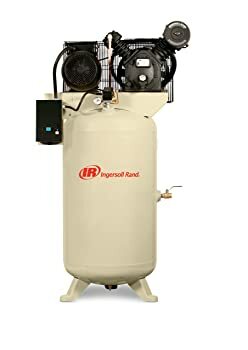 The Ingersoll Rand 454650102340N5 80 gallon air compressor offers you reliability and power. I bet these are the features you are looking for at the moment. Would you like to get a product that can run for outstanding durations without compromising its efficiency? If yes, then the Ingersoll Rand 454650102340N5 is without a doubt the product for you. Better yet, this appliance has been garnering some of the best reviews on retail sites since its manufacture. And we can attribute all these amazing features to the tool’s reliable performance. The reliability will also come in handy especially when you pair it with industrial air tools. Ingersoll Rand 454650102340N5 also retails with an ultra-powerful 7.5 HP motor. This is one of the most powerful motors I have ever seen on 80-gallon air compressors in the world. And thanks to the powerful motor, the appliance is able to deliver consistent air pressures. This further permits you to handle most, if not all industrial level jobs with ease. The air compressor also retails with a strong design and a vertically shaped body. This allows it to save on space without compromising its durability. If you take good care of it, then it should last for lots of years without issues. The tool’s body is also extremely strong. This is mainly because it is covered by a cast iron crankcase body that can withstand all accidental knocks and weather conditions. In regards to its size, the tool weighs 611 pounds and measures 48*39*77.